Powell, J.v. et al. "Gitxsan". The Canadian Encyclopedia, 16 October 2018, Historica Canada. https://www.thecanadianencyclopedia.ca/en/article/gitksan. Accessed 21 April 2019. Gitxsan (Gitksan), meaning “People of the River Mist,” live along the Skeena River of northwestern British Columbia in the communities of Hazelton, Kispiox and Glen Vowell (the Eastern Gitxsan bands) and Kitwanga, Kitwankool and Kitsegukla (the Western Gitxsan). In the 2016 census, 5,675 people claimed Gitxsan ancestry. 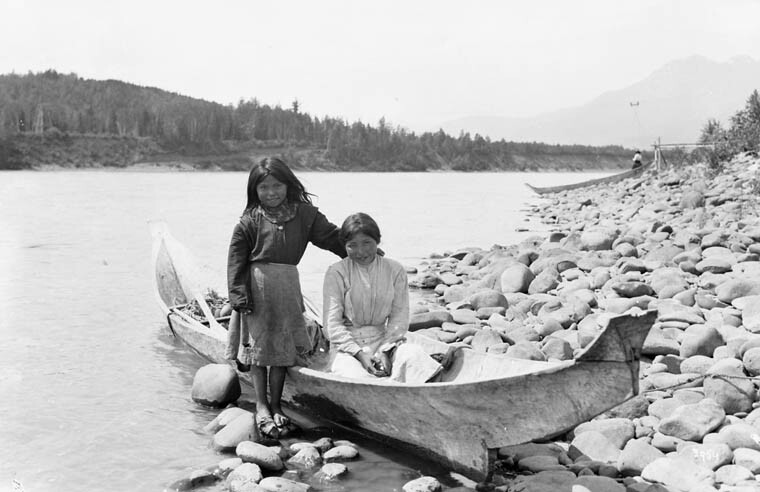 Two Gitxsan First Nation girls in a dugout cedar canoe by the Skeena River at Kitwanga (Gitwangak/Gitwangax), British Columbia (1915). According to the Gitxsan Nation, Gitxsan territory (known as Lax Yip) covers 33,000 km2 of land and water in northwestern ​British Columbia. This includes the Hazelton area and the Babine, Bulkley, Kispiox and ​Skeena Rivers​. Some Gitxsan territories are shared with or overlapped by neighbouring ​First Nations​, including Carrier Sekani, Gitanyow, Nisga’a, Tahltan, Tsay Keh Dene, Tsimshian and Wet’suwet’en. (See also ​Indigenous Territory​.) In the 2016 census, 5,675 people claimed Gitxsan ancestry. Pre-contact Gitxsan had various political, legal and economic institutions that maintained their societies. Since contact, the Gitxsan have emphasized their right to self-determination, including the right to manage their lands and govern their people. The Gitxsan are matrilineal, meaning that kinship is based on the female line. Gitxsan people are born into one of four kinship lineages (or clans) — Frog, Eagle, Wolf and Fireweed. Gitxsan spouses many not belong to the same clan. Clans have Houses (known as wilp), each with their own chiefs and territories. Historically, the most important aspect of each wilp was the control of their land and fishing territories and the inheritance of these assets by the children born into their mother’s wilp. The father’s wilp governed other responsibilities, such as the children’s education. It is estimated that there are more than 50 wilp in Canada and each has an oral history (adaawk) and songs that describe its ancestors and family history. Contemporary Gitxsan life continues to centre around the obligations and privileges of the li'ligit, community potlatch feasts, at which funerals, marriages, namings, adoptions and other ceremonies involving a change in identity are announced and guests are given gifts for witnessing. The Gitxsan language, a dialect of Nass-Gitxsan, is part of the Tsimshian language family, related to Coast Tsimshian and probably also to the Penutian dialects of California and Oregon. In 2016, ​Statistics Canada​ reported that 1,285 people identified as Gitxsan speakers, 98.1 per cent of whom lived in British Columbia. The Gitxsan language is gradually being replaced by English as fewer individuals speak Nass-Gitxsan, although some community schools teach Gitxsan. 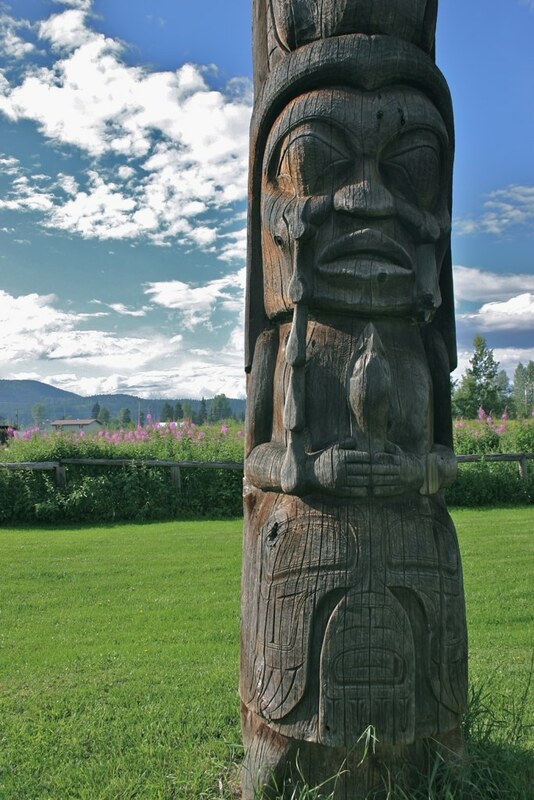 Due to the remoteness of Gitxsan territories in northwestern British Columbia, only a few European missionaries and traders made contact with the Gitxsan before the mid- to late-1800s. It was during the second half of that century that European encroachment on Gitxsan territories increased. During this time, the Gitxsan saw, among other changes, the coming and going of gold rush seekers, the installation of the Collins Overland Telegraph, the building of Hudson’s Bay Company​ trading posts and the imposition of White settlements. In time, a federal policy of assimilation saw Gitxsan children sent to residential schools​, where they were disconnected from their families, culture and language. When British Columbia entered Confederation in 1871, many of the Indigenous lands in the province were not ceded by way of treaties	or agreements. 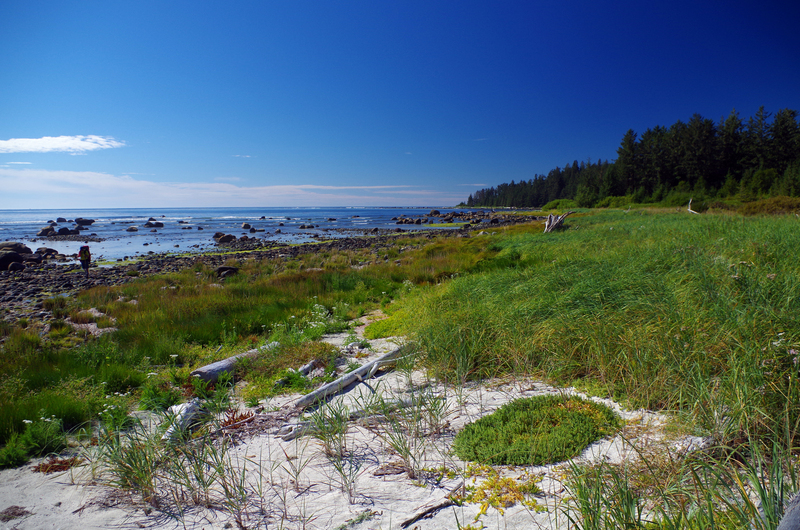 This has led to territorial and land rights disputes between various Indigenous communities in British Columbia and the provincial and federal governments. In the historic court case ​Delgamuukw et al v The Queen (8 March 1991), the hereditary chiefs of the Gitxsan and Wet’suwet’en claimed Indigenous rights to approximately 58,000 km2 (22,000 m2) of their traditional territories in northwestern British Columbia, an area approximately the size of ​New Brunswick​. The judgement by British Columbia Supreme Court Justice A. MacEachern stated that the Gitxsan and Wet'suwet'en did not have sovereignty, jurisdiction or Aboriginal title, and that such rights ceased to exist during the colonial period because colonial legislation exhibited a clear and plain intention to extinguish them, even though these laws did not do so expressly, nor did they even mention Aboriginal rights. The judgement did find that the Gitxsan were entitled to use unoccupied crown land in their claimed territory for Aboriginal subsistence activities. A Supreme Court of Canada judgement on 11 December 1997 found that a collective extinguishing of Indigenous rights	pre- or post-contact had occurred. Part of the Delgamuukw decision also created a legal precedent for proof of Aboriginal title that used oral history testimony as supportive evidence in addition to written testimony. The Gitxsan are currently in stage four of the British Columbia treaty process. 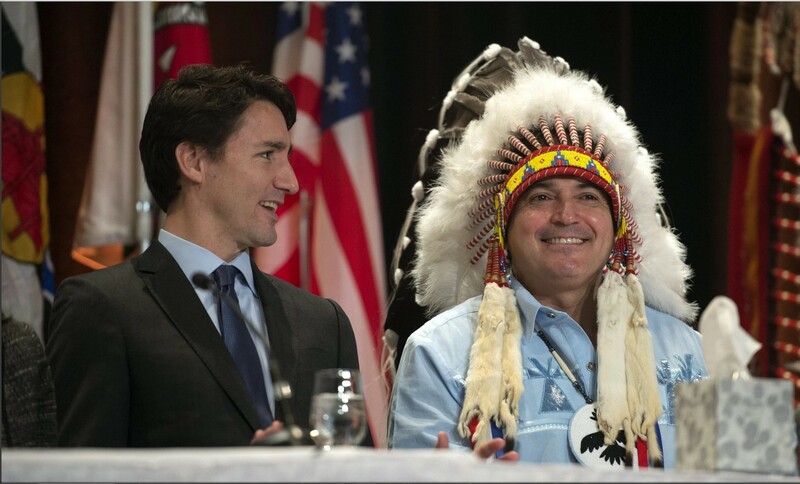 There are six stages in total, with the end result aimed at self-government, monetary and land resources and the acknowledgment of Indigenous rights and title to territory. P. Dawn Mills, For Future Generations: Reconciling Gitxsan and Canadian Law (2008). CBC NEWS Read about the legacy of Gitxsan artist, Judith Morgan. 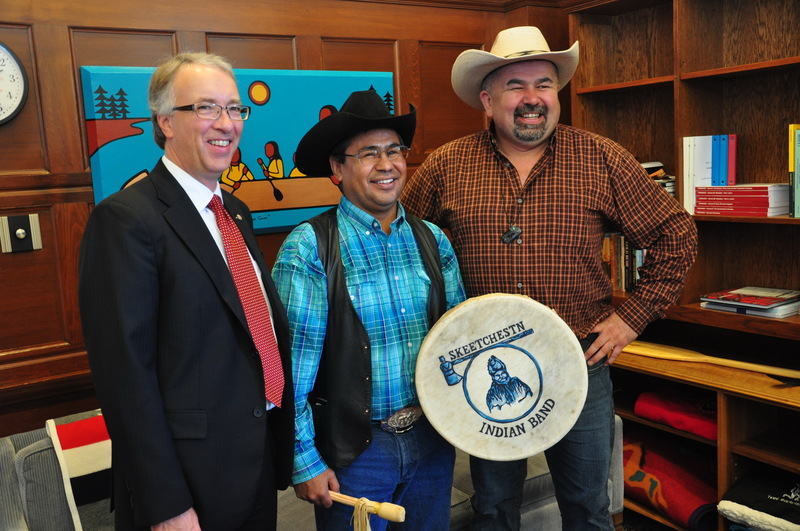 BC TREATY COMMISSION Learn more about the making of modern treaties in British Columbia. GITXSAN NATION Explore the official website of the Gitxsan Nation to learn more about their history, culture and society.